Huffington Post Canada: Should Canadians Worry About Hormones in Milk? Farmer’s Hot Line: Why Do Farmers Use Seed Treatments? I have also been interviewed for CBC Radio One’s Eyeopener show with David Grey, AM 770 with Bruce Kenyon and 660 News with Doug Reynolds. I have had the honour of speaking at conferences/meetings/events about my journey advocating for agriculture. I have presented at the Canada Beef employee conference in Banff, AB on “The Influence of the Mommy Blogger and Why I Agvocate” and I spoke at the Alberta Seed Grower’s Association’s annual general meeting and banquet in Edmonton January 2015 on the same topic, and the Farm & Food Care Ontario conference in March 2015 on “The Good, The Bad & The Ugly of Social Media in Ag“. I spoke on a panel at Farm Forum in Saskatoon 2015 about GMO communication with an organic farmer and a vegan, and at the Farm & Food Care Saskatchewan Conference in December 2015 on my presentation “Don’t Let the Activists Drive Your Combine“, which I also shared at Manitoba Ag Days, at the Ag Service Board Meeting in Edmonton. I was honoured to speak again at the Alberta Seed Growers’ banquet/AGM in January 2016 on “A Year in the Life of Advocating for Agriculture“. 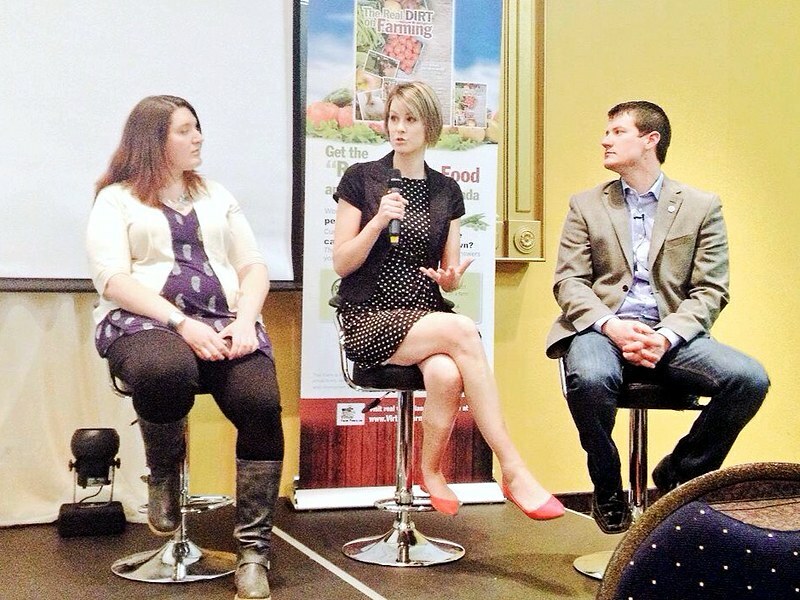 Carrie Mess, Sarah Schultz & Andrew Campbell panel at Farm Food Care Ontario Conference 2015. I have decided not to continue with any speaking engagements, other than panel events. Thanks for your interest and understanding, if I am a good fit for your panel, please let me know!